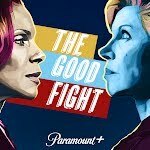 Unsubscribe from The Good Fight? Picking up one year after the events of the final episode of "The Good Wife," an enormous financial scam has destroyed the reputation of a young lawyer, Maia Rindell (Rose Leslie), while simultaneously wiping out her mentor and godmother Diane Lockhart's (Christine Baranski) savings. Forced out of Lockhart & Lee, they join Lucca Quinn (Cush Jumbo) at one of Chicago's preeminent law firms.